These fingerless mitts I made for an Intro to Cables class we had at The Little Knittery. But I'm liking it as a great project for Holiday knitting, certainly meets all my requirements for gift knitting: quick, pretty easy and doesn't require much yarn... gotta keep chipping away at my stash! 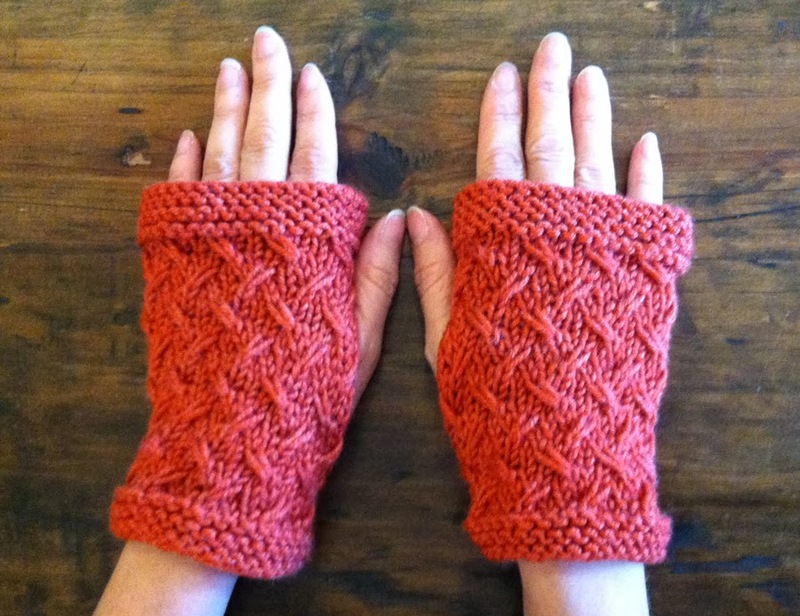 These used 1/2 a skein of Pediboo by Frog Tree, so 2 pairs from one skein! 1 skein Pediboo Yarn (182yds/165m) A blend of 80% Machine Washable Merino and 20% Bamboo Viscose. If any adjustments are made to the pattern in regards to the stitch count add or subtract in multiples of 4, the number of stitches between the *'s. Stockinette Stitch (St st): alternate rows of Knit and Purl. Sl 1: Go into the stitch as if you were going to purl and slip it from the left to the right hand needle. Work 4 sets of Wild Oats Pattern. 32 rows total. On the last set of the Wild Oats Pattern Knit Row 8. Sew side seams leaving a hole for the thumb @2.25" from the top and 2" from the bottom or how best it fits your hand. Rows 2 and 6: Sl 1, P1, * P1, sl1, P2, rep from * to end, P1. Row 3: Sl 1, * Slip next 2 sts onto CN and hold at back of work, K the slip st from the LHN, K2 from CN, K1, Rep from * to last st, K2. Row 7: Sl 1, K1, * K1, slip the slip st onto CN and hold at front of work, K2, K1 from CN, rep from * to end, K1. I have 5 sisters and 7 nieces and haven't even started on my Christmas list so everyone might be getting identical pairs of these!!! Thanks for your great designs!!! What weight yarn was used in the sample in case we can't find the yarn you used and need to substitute? The yarn used is a worsted weight. Can a person sell the finished product from this pattern? Do you know why I learned to knit? I had one of your crochet patterns and saw the Boat Neck Sweater. I just ordered yarn for it. I learned to knit a year ago. I fell so in love with that, I actually got over my fear of knitting and learned. Why fear? I am dyslexic and was told I would never type, nor knit. I touch type, writer, and now knit. I am designing for myself. You're not the only inspiration, but your designs put me over the edge. I'm going to cry now. You changed my life. In the best ways possible. I won't go into it, you just did and you need to know that. So true Sally & an excellent way of putting it! 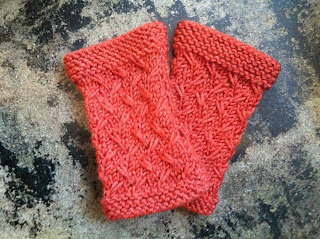 I love the look of these fingerless gloves. However, I have tried the pattern about 12 times and it looks nothing like the photo. I have a particular problem with rows 3 and 7. It seems like there is something missing in the instructions....or am I crazy. Sorry...I just need to know what I'm doing wrong. Sorry to hear you're having problems, but good to hear you're not giving up! ;) Can you let me know specifically what you're having trouble with in those rows? Is it using the cable needle? Hi Karen thanks for responding to me. In row 3 you slip a stitch from the LHN (purlwise) to the RHN and then slip stitches onto the cable needle and then knit the slipped stitch, knit the 2 from the cable and then K1. You then ask us to repeat from * to * but there is no sl st in between the *s??? I have a similar problem with row 7. Sorry to be so dense, but I'm just not getting it. Thanks so much for your help. I really want to make this pattern. No problem JP, I think I figured out what's throwing you off. I have you slip the first stitch of the row, the edge stitch but the first slip stitch that you knit from the left hand needle is actually the 4th stitch in. Yay!!! Good to hear! What a lucky friend :) Thank you for writing, it's always good to know when an explanation makes sense and helps! Happy Holidays Minmona! Hi, I'm wanting to make some of these for the homeless, I'm in the UK and go by weight of yarn needed not yardage, can you tell me how much in weight I need?